Friday, when I walked to the party goods store to check out some Halloween stuff, I passed a store filled with stuff for and about cats. Yes, these stores exist also. 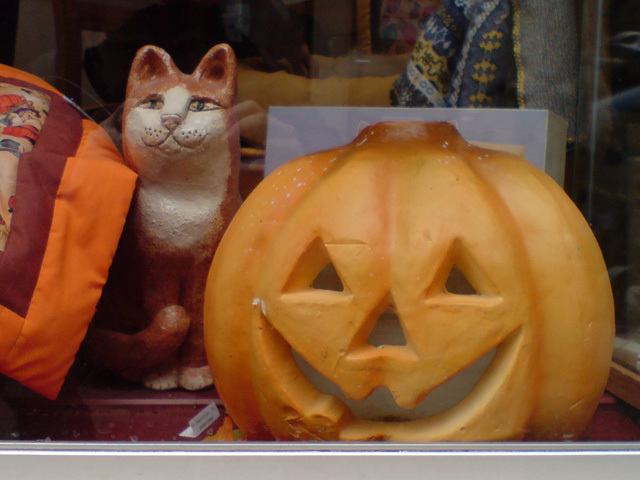 Anyway, in the display window I saw this pumpkin, which must be one of the most kitsch pumpkins I’ve ever seen. Not that I mind kitsch per say. The party store also had some ugly stuff: badly made bats and things like that. Still, I love Halloween. I like the iconography of it. The pumpkins, spooks, and other things to dress up the house or whatever. As long as it’s well crafted and the design looks convincible.